Look out, sleepers. There’s a new Leesa pillow in town. Many of you may already be familiar with the company’s mattress and standard pillow — but allow me to introduce the Leesa Hybrid Pillow. 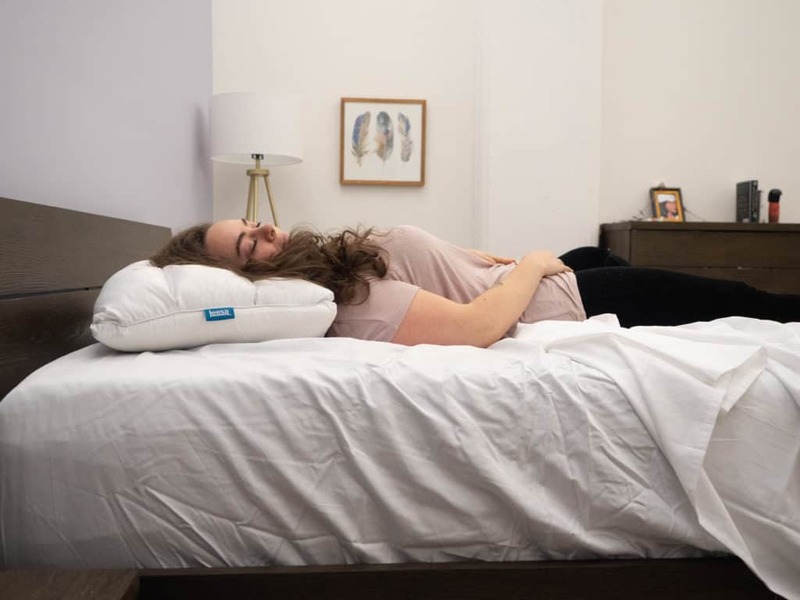 As its name suggests, this sleep accessory features a multilayered construction that looks and feels totally different from its pillow-predecessor. So, Sleepopolis is here to test its full performance and see what it’s really all about! In this review, I’ll be getting up close and personal with Leesa’s latest addition to the pillow game. I’m going to show you what it’s made of, how it feels, and test it in every position so we can figure out which sleepers might benefit the most! 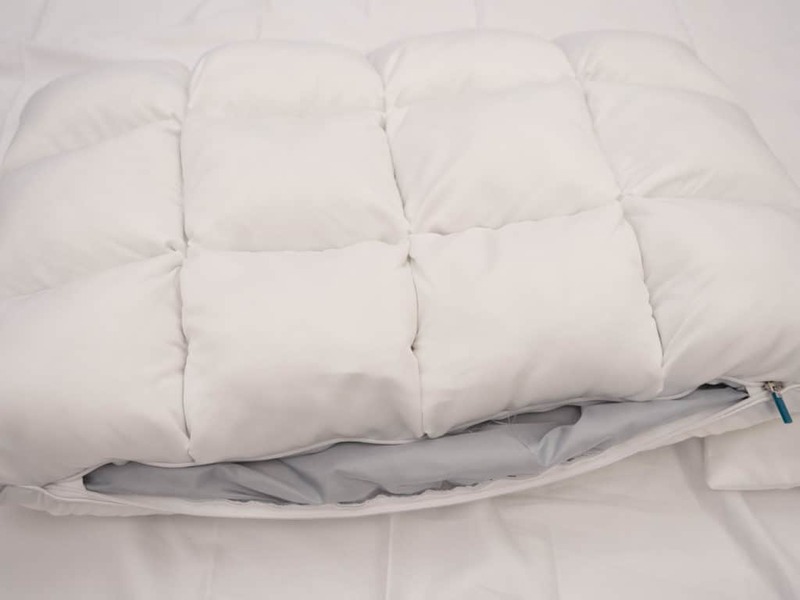 The cover of this pillow is quilted, and inside each quilted pocket is a fluffy down-alternative, giving the Leesa Hybrid pillow a classic cloud-like feel. The cover fabric of this pillow is made from a blend of Tencel®Lyocell and Frio/Nylon. 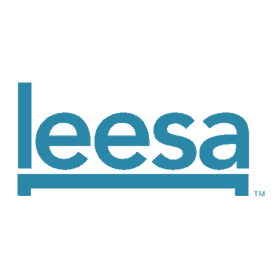 It features a 400 thread count and is Silpure treated, which means it’s more resistant to bacteria. The cover is quilted, and inside each quilted pocket is a fluffy down-alternative called poly microfiber. 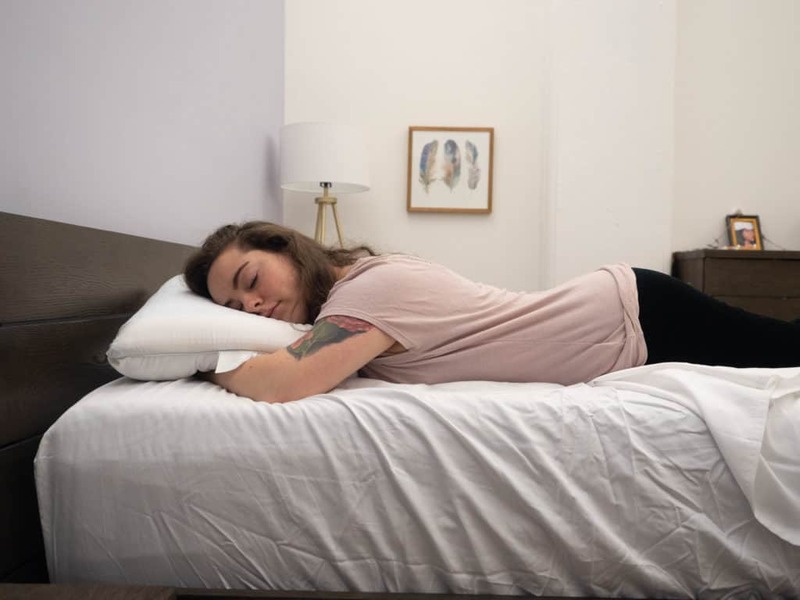 Unlike the original Leesa pillow, the Hybrid pillow features an adjustable design made of a down-like fiber side, a ventilated gel side, and an inner pillow that’s sandwiched between both layers. The quilted pockets of poly microfiber make one side of the pillow soft and cushiony, while the other side offers a cooler feel from the gel pad, and an even loft with firmer support. Because of the dual nature of this construction, sleepers are going to experience a different feel depending upon which side of the pillow they sleep on, and whether or not they choose to leave the middle insert inside. When you unzip this pillow, you’ll find the inner pillow that’s covered in 210 thread count polyester, and filled with fluffy microfiber. Like I said, the middle insert is removable, allowing sleepers to customize the loft and support of the pillow. 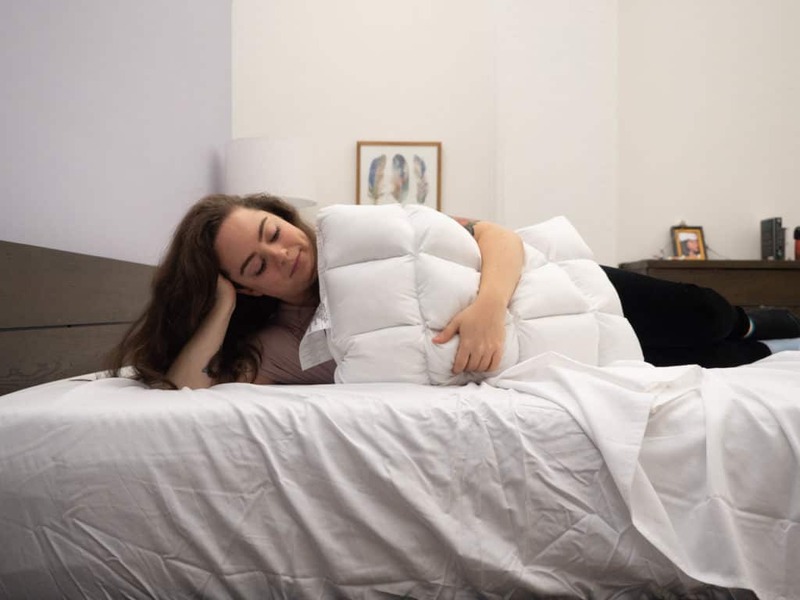 Essentially, the Hybrid offers four different sleep options as you’re able to choose between the cool, firmer gel side, the plushly fluffy quilted side, and to use or not to use the middle insert. So, now that we know how this pillow was made, let’s take a closer look at how it feels and which styles of sleepers might benefit the most from its unique design. As some of you might remember, the standard Leesa pillow offers a consistent sleep experience on either side. With the hybrid, there are two distinctly different sleeping surfaces. The hybrid pillow has a tufted side with what the company refers to as “a more traditional feel.” This means that it feels more plush, and the soft down-alternative that fills each quilted pocket is going to offer that fluffy, cloud-like feel. In fact, it even resembles a cloud which I, personally, find to be a lovely aesthetic perk. On the other side of the pillow, you’ll find a very different feel and firmness. The reverse side of this pillow has a cooling gel insert which is intended to offer a “permanently cool side of the pillow.” Because of the flat, thick nature of the gel pad, the cool side of the pillow is going to much firmer than the plush side. The cover fabric is consistent throughout the entire pillow and feels silky smooth and cool to the touch. 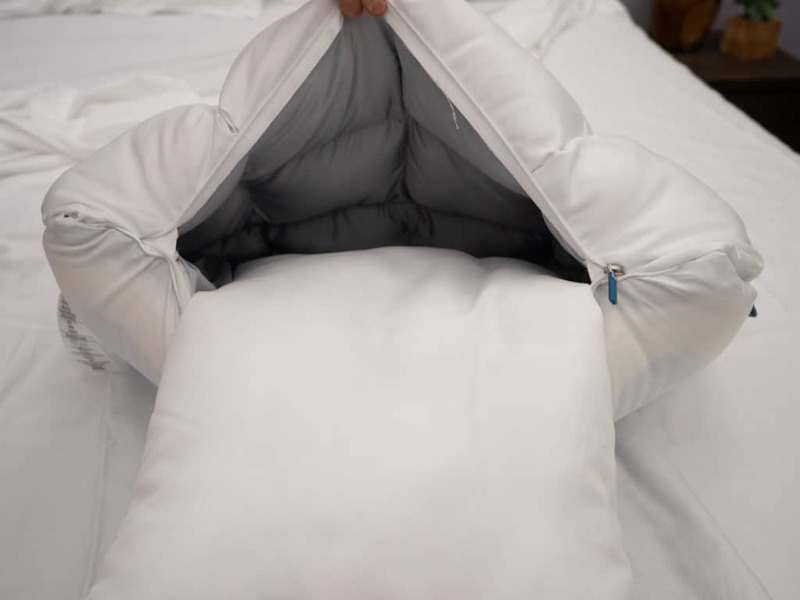 There is a zipper that spans one side of the pillow which allows you to reach in and play around with the inner pillow. The middle insert is sort of a fun part of this accessory as you can use it to change the overall feel and loft of your Leesa Hybrid pillow — or you can take the inner pillow out and use it as a travel pillow. Because this pillow is adjustable, the folks at Leesa say that it is suitable for all sleeping positions. That being said, this pillow has a fairly lofty build with the middle insert still inside. Stomach sleepers who need a thinner pillow with lower loft might want to take the inner pillow out to reduce the height, or even sleep on the middle insert itself. Back sleepers might particularly enjoy the plush “traditional” side of the pillow as it’s softer and allows a nice sink into the pillow. The tufted pockets offer a gentle head-cradling quality when you’re in the supine position, while the firmer side might be better suited to lateral sleeping. When I saw this pillow for the first time, my first two thoughts were: ‘Wow that looks like an actual cloud’ and ‘Hmm, that doesn’t look anything like the standard Leesa pillow!’ As it turned out, it doesn’t feel like the standard Leesa pillow either. I started testing this pillow in the supine position exactly as it came (with the middle insert still inside). The quilted nature of the fluffy, down-like pockets felt really cozy and, much to my delight, did offer that sleeping-on-a-cloud type feel. While the cover fabric feels silky and cool, I did find myself longing for the warm, cuddly fabric that covers the original Leesa pillow (and the Leesa mattress). Lying on my back, I was really enjoying the fluffy, lofty profile of the traditional side. 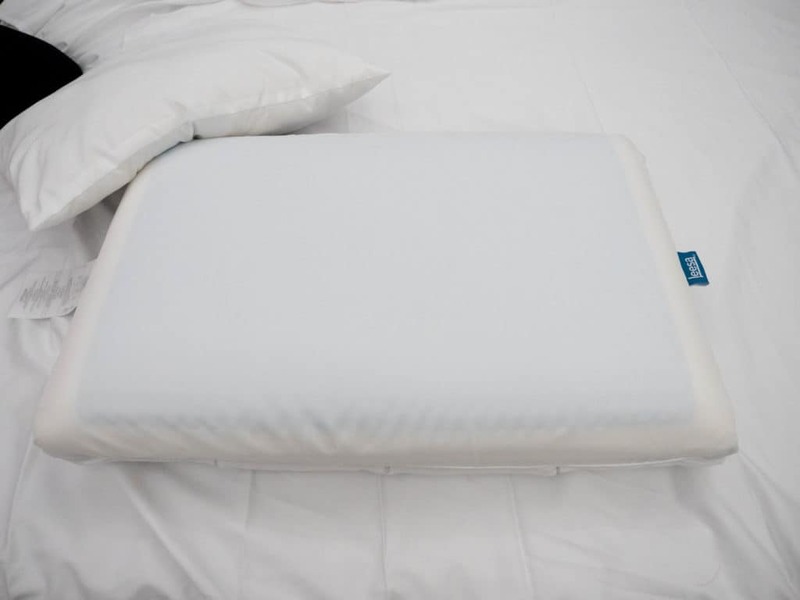 It definitely has a soft level of support, but the layers of inner pillow and the firm gel pad work together to boost the loft and overall support. So, I never felt like my posture slipped out of neutral alignment, and I was really enjoying the way the tufted pockets conformed to my head and neck. So I flipped the pillow over to the gel pad side to see how it compares and, frankly, it didn’t suit me as well. When I’m on my back, I like a little extra fluffy comfort, but the gel pad is actually pretty firm and has a bumpy texture that comes through the pillowcase. I would say that yes, it does feel cooler than the plush side, but it’s a little too firm for my liking. I switched to the lateral position as I do tend to prefer a firmer feel when sleeping on my side. Sure enough, the gel side was better suited to this position, and I liked the even nature of the loft better for this sleep style as well. However, I still was not feeling very compatible with the overall feel of the gel pad. It’s thick firmness is tough to fold, and I do like to bunch and fold my pillow a little bit when I’m on my side. I didn’t really love the tufted side for side sleeping either as it’s quilted nature adds an uneven loft that makes me feel a little off balance. So I moved into some stomach sleeping to see which configuration works best for the prone position. I suspected that the firm side of the pillow was not going to work for me on my stomach, as I typically need a soft, flat pillow in order to maintain healthy spine alignment. So, I only tested that side of the pillow in the prone position for a minute or so, just to confirm that my suspicions were correct. Between the lofty build and the firm gel pad, my neck was craned out of alignment with my spine. I flipped the pillow to the plush side, and even though it was softer, it was still too lofty. I took the middle insert out, and it made quite a difference! With the extra layer gone, the pillow’s loft lowered enough to keep my spine aligned, and I still got to enjoy the fluffy comfort of the quilted pockets. I noticed that the inner pillow was also soft and plush, so I tried sleeping on only that in the prone position. 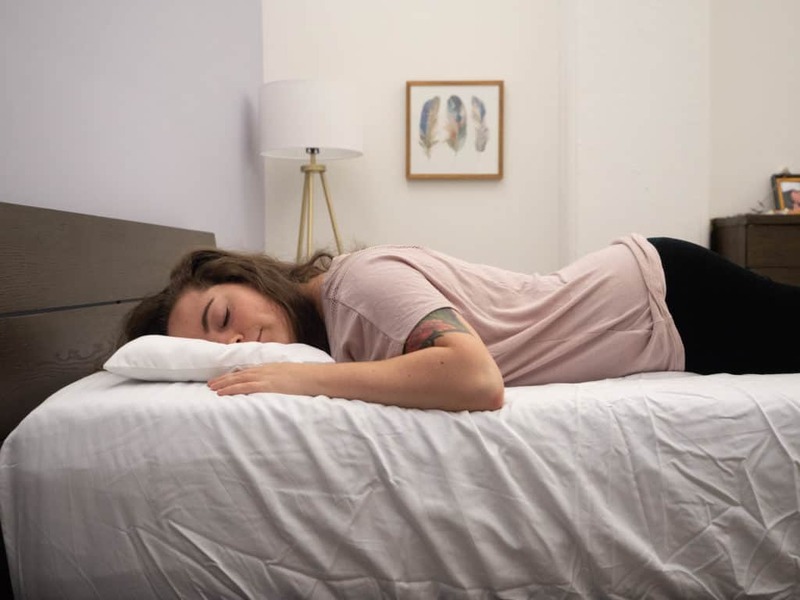 While I do personally prefer a little extra support, I could definitely see how stomach sleepers who only like the slightest bit of cushion between themselves and the mattress could benefit from using the inner pillow by itself. Ultimately, I would keep the middle insert inside the pillow for every sleep style except the prone position. And while I do appreciate the cooling qualities that permeate throughout the pillow, I think the gel pad is not comfortable enough to sleep on directly. I think it does a good job of keeping the pillow cool without having to flip the pillow to the gel pad side. I did find the best configuration to be plush side up, middle insert in, lying on my back. It just offers this fluffy cloud-like feel that I can’t get enough of. So, while this pillow’s multi-layered construction could be useful for many styles of sleepers, I’d be lying if I said I didn’t have a favorite! I thought this pillow worked pretty well for both of these styles. Like I said, this pillow has a fluffy, lofty build that I found to be great for hugging. I like to hold the pillow under my arm with the gel pad facing my torso so that I can get a good grip on the plush, tufted pockets. Plus, the cool gel pad felt surprisingly pleasant on my stomach. Because this pillow is pretty lofty and has a little extra firmness from the gel pad, I also enjoyed holding it between my legs. Its fluffy build offered a nice little boost for my hips and relieved some pressure in my lower back. 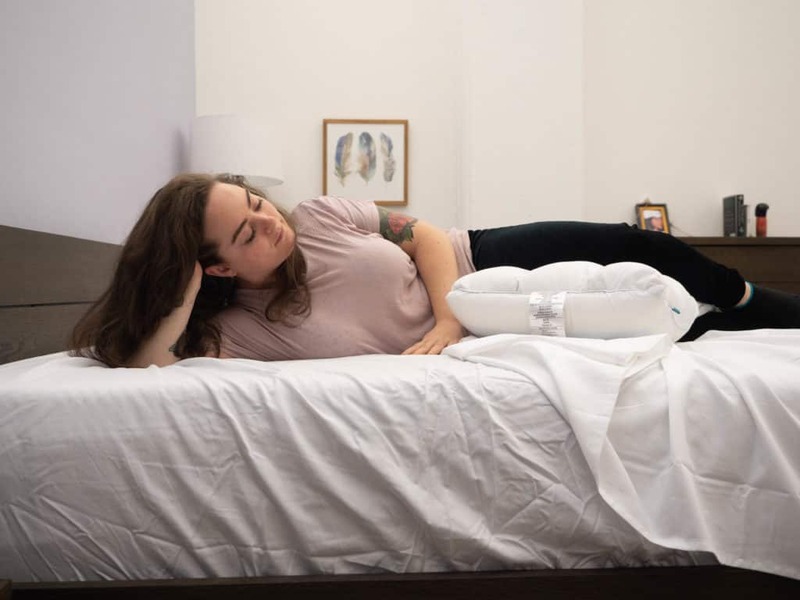 I prefer to use it with the gel pad facing down and resting on the leg closest to the mattress, but I think it could offer some nice pressure relief either way. Not Reversible — This pillow is advertised as both adjustable and reversible. This can be a little confusing as you cannot actually turn this pillow inside out and use it that way, like the word ‘reversible’ implies. So, it’s important to note that what the company means by ‘reversible’ is that there are two distinct sleeping surfaces from which to choose. Firm Gel Pad — The gel pad does offer a cooling quality, but it’s also quite firm. So, sleepers who want to sleep on the ‘cool side’ of the pillow but also want a softer, plush feel might have a hard time reconciling the two. Luckily, I found the pillow to sleep cool regardless of the side I slept on. Gel Pad Not Washable — Before washing your pillow, be sure to go in and carefully remove the gel pad. The gel pad really shouldn’t get wet, but if it does get dirty, just spot clean with a damp cloth and mild detergent. 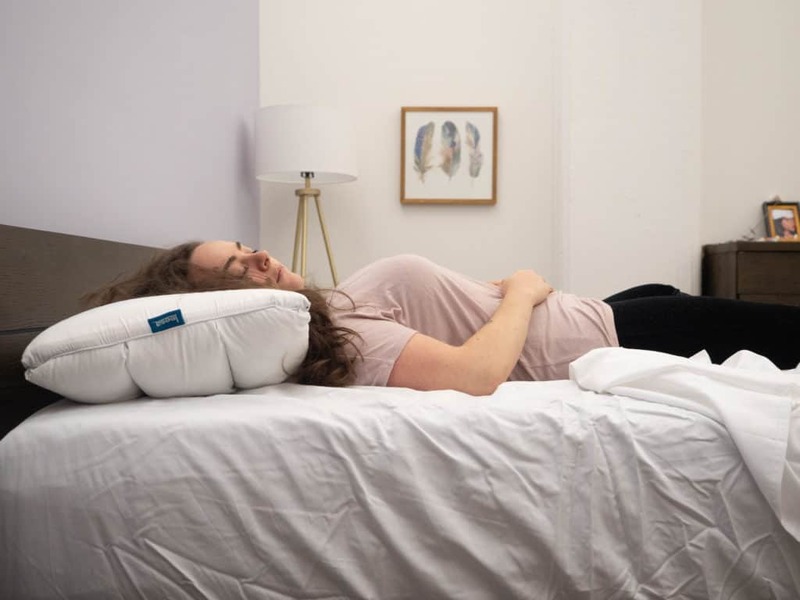 Combo sleeps — Because this pillow offers different levels of support depending on how you adjust it, it might be especially useful for combo sleepers. Folks who transition between several positions over the course of the night can flip the pillow or remove the middle insert to accommodate different styles and find their perfect level of comfort. Sleeps Warm — The silky cover fabric, breathable microfiber, and cooling gel pad work together to make sure the pillow sleeps cool. 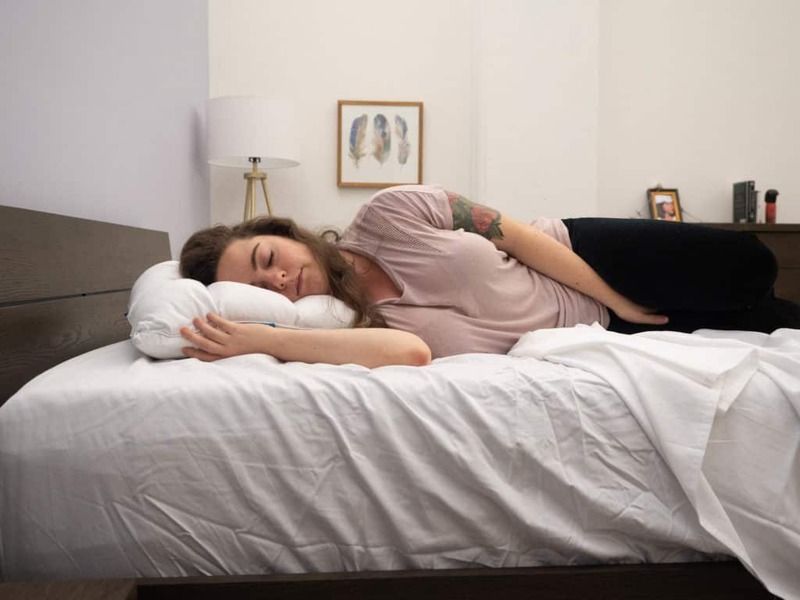 Sleepers who run hot or are prone to night sweats might enjoy the cooling features of this pillow, and those who like a firmer feel will be especially compatible with the ‘cool side’ of the pillow. Is Down with the Plushness — The traditional side of this pillow features tufted pockets filled with fluffy down-alternative that offer a cloud-like feel. Because the fill stays put within each quilted pocket, the pillow maintains its feathery, lofty build without much fluffing required! 100 Night Trial — If you’re not sure you’re going to love this pillow, that’s okay! Leesa lets you test it out for 100 nights before you have to make any tough decisions. Wash Care — Remove the gel insert for spot cleaning. For the outer cover and inner pillow, machine wash warm on a gentle cycle with like colors. Do not bleach, tumble dry low until thoroughly dry.